Simon Says Have a Heart! This week the challenge is HAVE A HEART! I adore the Puppy Love stamp set and coordinating dies from Reverse Confetti. Normally I don’t like cute images. Ever since Charlie my dog came to live with us, I started loving cute images especially dogs. Naturally huh! So it was a no brainer when I picked this set for the challenge. Anyway, I decided to use the images from this set for both the focal point as well as for the background for the card. I started with die cut two Neenah Desert Storm kraft cardstock using Simon Says Stamp Stitched Rectangle die. One larger panel and the other couple of sizes smaller. On the larger panel, I stamped the images on the dogs and heart cluster using Wet Cement shadow ink from Hero Arts. I kind of paired the dogs together and stamped the heart cluster on top of them. I stamped the entire panel. This is my background. 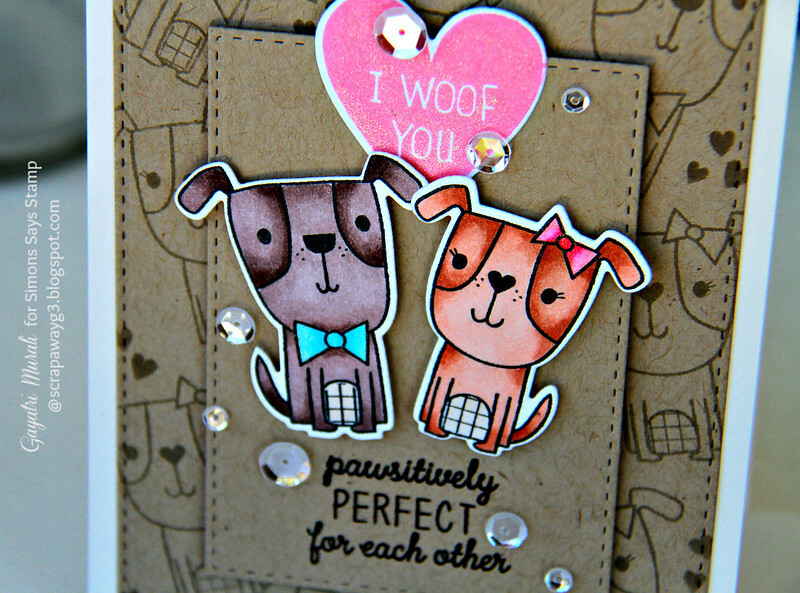 For the focal point, I stamped, copic coloured and die cut the two dogs and the “I Woof You” heart shape. On the smaller kraft panel, I black heat embossed the sentiment from the stamp set. The adhered the two dog die cuts using the foam adhesives. The “I Woof You” heart shape is adhered flush on top of the two dogs. I brushed the heart shapes and the bows of the dogs with Clear Wink of Stella. I embellished with Sparkling Clear sequins from Pretty Pink Posh. To assemble the card, the larger background panel is adhered flush on the cream card base and the smaller panel is foam mounted over the larger panel. I love the adorable critters!! TOO cute! Love everything about it…the background is fabulous! Love your card, Gayatri! The puppies make me smile! 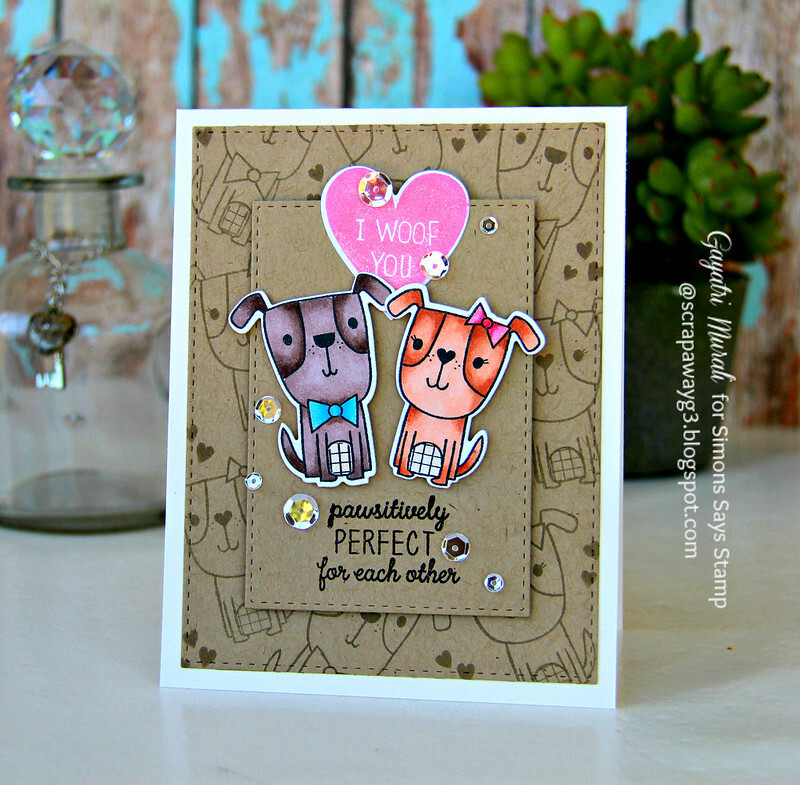 A fabulous card Gayatri, I super design and Kraft cardstock with the cute pups……..lovely coloured with the cute pups and lovely details!! So cute! I love those little dogs – beautiful job coloring them!